Royal Doulton BUNNYKINS bone china mug - Storm Scene. Dispatched with Royal Mail 2nd Class. Royal Doulton Snowman collection "Building a Snowman" Mug. Dispatched with Royal Mail 2nd Class. THE AUTUMN BEAKER IS 1ST QUALITY. THESE DO NOT HAVE ANY CRACKS OR BLEMISHES AND ARE ALL IN PERFECT CONDITION AS HAVE HARDLY BEEN USED, SPENT LONGER IN DISPLAY CABINET. Royal Doulton English China - Expressions Windermere - x 2 mugs. Excellent condition. Set of Royal Doulton miniature Toby character jugs - the Three Musketeers. C.O.P.R. 1955. Bunnykin 60th Anniversary Plate And Mug And Mug. Dispatched with Royal Mail Signed For® 2nd Class. A boxed Royal Doulton Winnie the pooh christening gift set, comprising plate, bowl and mug. 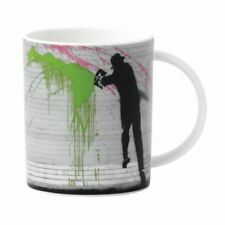 Beautifully decorated,this mug is ideal for the collector or beginner. United Kingdom. West Yorkshire. Kirkwood Hospice. We respect individual needs and wishes, caring for each person to help them achieve the best possible quality of life. OR TO ADD TO A BUNNYKINS COLLECTION. PERFECT CHRISTENING GIFT. ONE HANDLED MUG & PLATE. Circa 1999. READ BEFORE BUYING. The Christening Set. Royal Doulton “The Winnie-the-Pooh” Collection. 1 x Mug and 1 x Plate. "SPRING" Mug from Brambly Hedge series by Jill Barklem for Royal Doulton. Collection of 15 Pieces. 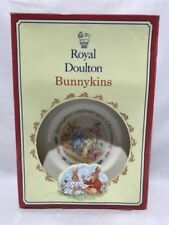 Royal Doulton Bunnykins. Dates range from 1940s to 1980s. IT'S A GREAT ITEM THAT WILL ENHANCE ANY GOOD SNOWMAN COLLECTION. FULLY MARKED ON THE BASE IT IS FIRST QUALITY. Bunnykins in lovely order but Peter Rabbit has a little mark on inside lip : check photo. John Beswick:Collectors Scrooge & Marley, Tankard Mug. Beswick ROYAL DOULTON Mug. Scrooge & Marley. Limited 1973. New Royal Doulton ‘Bunnykins’ ‘Hug-a-Mug’ in new and perfect condition. Base date shows 1984 as year of manufacture. Scene shows making daisychains. Please note box shows some sign staining on one side hence sale price. Please see photo for detail. Lovely item and the perfect birthday / christening gift for both girls and boys. This is priced to sell so don’t hesitate! Brambly Hedge Full Size Beaker. Royal Doulton Brambly Hedge Collection. The Beaker features Jill Barklem's "Brambly Hedge" illustrations. Royal Doulton Brambly Hedge Gift Collection. Marked "Royal Doulton - Jill Barklem - 2001". A large, Royal Doulton Smuggler character jug design no. 18cm (7") tall, 17cm wide, 14cm deep. LARGE ROUND VEGETABLE SERVING DISH WITH LID. and we have no history with them. AND IS 7" TALL. BUNNYKINS mug Cup "AFTERNOON TEA" royal Doulton. Dispatched with Royal Mail 2nd Class. Great cond, height is 3.75". Bunny mums having afternoon tea , with child bunnies playing next to them . Maid carrying tea on other side 😁. OTHER DOULTON WINNIE THE POOH HERE ! ROYAL DOULTON. WINNIE THE POOH. asked Pooh anxiously. 'How long does getting thin take?'. GETTING THIN. IT'S A GREAT ITEM THAT WILL ENHANCE ANY GOOD ROYAL DOULTON OR BRAMBLY HEDGE COLLECTION. MARKED ON THE BASE IT IS 1st QUALITY. THERE IS NO APPARENT WEAR TO THE PAINTWORK. IT'S A GREAT ITEM THAT WILL ENHANCE ANY GOOD WIND IN THE WILLOWS COLLECTION. FULLY MARKED ON THE BASE 1st QUALITY. APPROX 3 1/2" HIGH. Royal Doulton. Older piece but not really early. In good condition for age but it does have all over age related crazing see photos. 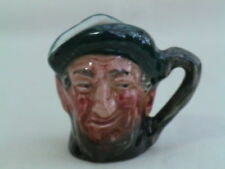 Lovely ROYAL DOULTONDON QUIXOTE CHARACTER TOBY JUG - numberD6455 produced1956. APPROXIMATE SIZE: HEIGHT 20CM, WIDTH AT WIDEST 17CM, DEPTH AT WIDEST 14CM. Royal Doulton Rustic England Tankard D6297. Condition is Used. Made of china. No chips or cracks. 5 ins tall approx. ROYAL DOULTON FINE BONE CHINA "BUNNYKINS" MUG WITH CHRISTENING SCENE. ON THE FRONT FACE IS PRINTED THE BUNNYKINS FAMILY IN CHURCH AT THE CHRISTENING. ON THE REVERSE ARE THE WORDS"BUNNYKINS CELEBRATE YOUR CHRISTENING". To one side it has design HW17 Engine Pulling Carriage and to the other it has HW17R To The Station. This is a rare opportunity to acquire a Charming Royal Doulton Bunnykins Don Shape 2 Handled Mug. IT'S A GREAT ITEM THAT WILL ENHANCE ANY GOOD BRAMBLY HEDGE COLLECTION. FULLY MARKED ON THE BASE IT IS 1st QUALITY. Royal Doulton Brambly Hedge The Wedding beaker / mug. Good condition no damage. I have been told it’s only ever been in a cabinet. Measures approx 9cm wide and 8.80cm high. Beswick Mug. Scrooge & Marley Limited Circa 1973. Royal Doulton Bunnykins Christening Mug. this two handled mug is in good condition. in its original box. one handle at the top has a 0.5" crack (see 6th photo). ROYAL DOULTON ENGLAND BUNNYKINS CELEBRATE YOUR CHRISTENING 2 HANDLE MUG - RABBIT. Dispatched with Royal Mail Signed For® 2nd Class. IT WILL ENHANCE ANY BRAMBLY HEDGE COLLECTION AND AN IDEAL CHRISTMAS PRESENT FOR AN AVID COLLECTOR. BEAKER IS APPROX 3 1/4 " HIGH. Royal Doulton Sherbrooke 3 3/4 Inch Mugs - 1st Quality - Dated 1970 New Unused ! 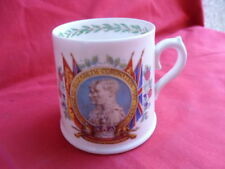 Royal Doulton Sherbrooke Mugs -1st Quality. Dated 1970 Backstamp. As New Unused. Quality China At The Right Price! "Lord Woodmouse". Royal Doulton Brambly Hedge. Features Jill Barklem's "Brambly Hedge" illustrations. 25th Anniversary Beaker. Excellent condition. Collection of 6 mug coasters C. 1930. Crown Staffs/New Chelsea.